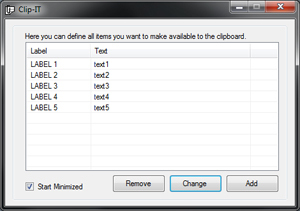 Clip-IT is a software utility to put predefined text strings on your Windows clipboard. This makes those text available for copy/paste operations in other programs: just select a predefined text and paste it in another window by pressing the CTRL+V keyboard combination. I wrote Clip-IT because I often have to work with text strings that are always the same. Because Clip-IT uses the Windows clipboard it is almost compatible with every windows software. Clip-IT will add an icon to your system tray. 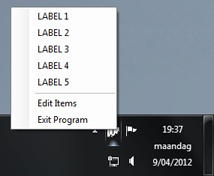 This is the area in your Windows task bar, next to the system clock. Right clicking this icon will open a context pop-up menu which will show all the texts you defined in Clip-IT. You can put any text on the clipboard by just clicking an item from the pop-up menu. The pop-up menu actually doesn't show the complete text strings: it only shows labels to describe each text string. You can define these labels yourself. The text Strings can have a size of up to 1024 characters. I introduced the system with labels to avoid a very wide pop-up menu. Double clicking the tray icon will open a window where you can add or edit new text strings. Here you will see a list with all created labels and the belonging text strings. The application automatically starts when Windows starts. For this the setup applications adds a shortcut to the start menu's 'startup' folder. If this bothers you, the shortcut can simply be removed from the startup folder. Here you can download the full setup application for Clip-IT.